There is no magic wand — no single best solution — for battling obesity, but the UO is fully engaged in finding ways to address the national epidemic. 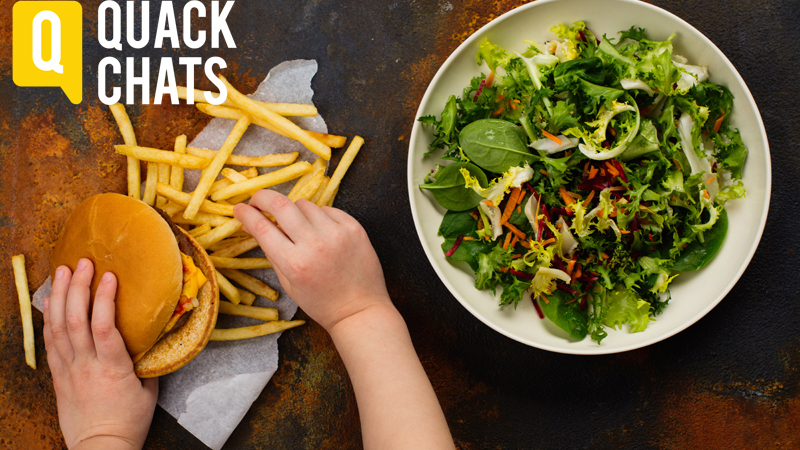 The challenges and potential pathways to help individuals and families better obtain and maintain a healthy weight will be the focus of a Wednesday, July 12, Quack Chats pub talk by two UO researchers. The event, free and open to the public, will begin at 6 p.m. at Falling Sky Pizzeria in the Erb Memorial Union. In the United States today, some two-thirds of adults are overweight or obese. One in five children and adolescents are obese. As part of her presentation, Leve will highlight her research on children who are adopted at birth and how this design can help to understand whether weight issues reflect the genetics they were born with, the family environments of the families that adopted them or a combination of both. Leve also will provide an overview of how researchers in the UO’s new Health Promotion and Obesity Prevention Initiative — one of the UO’s Clusters of Excellence — are approaching obesity issues through avenues such as family interactions, food choices and exercise. Initiative member Tasia Smith, who joined the UO last September, also will speak. She'll detail a new project in which she’s working with residents in the Oakridge area to increase access to healthy food choices. Smith’s project, funded by the UO’s Office of the Vice President for Research and Innovation, is exploring the feasibility and acceptance of a rural-based community partnership with a major food retailer. What she learns in the study could lead to a community-partnered intervention program that would increase the accessibility of health foods in rural areas in Oregon. The prevalence of obesity in rural areas often is higher than in urban areas, Smith said, because of such things as poor dietary habits, a lack of nutritional information and limited access to preventative care and healthy, affordable food. Before joining the UO, Smith was part of community-based programs in northern Florida and the Bronx, New York. “What we learn through our efforts in the Health Promotion and Obesity Prevention Initiative can help us tailor interventions that take into account what is happening in each individual’s case,” Leve said. Fisher will speak at 3 p.m., Thursday, Aug. 3, at the Museum of Natural and Cultural History. On Wednesday, Aug. 9, Fisher will present his talk, beginning at 6 p.m., at Falling Sky Pizzeria in the EMU. He will provide insights about eclipses, what people can expect and how to view the eclipse safely.